This is just a pair of boots but boots can be interesting sometimes, especially those some of the human statues in Las Ramblas wear. 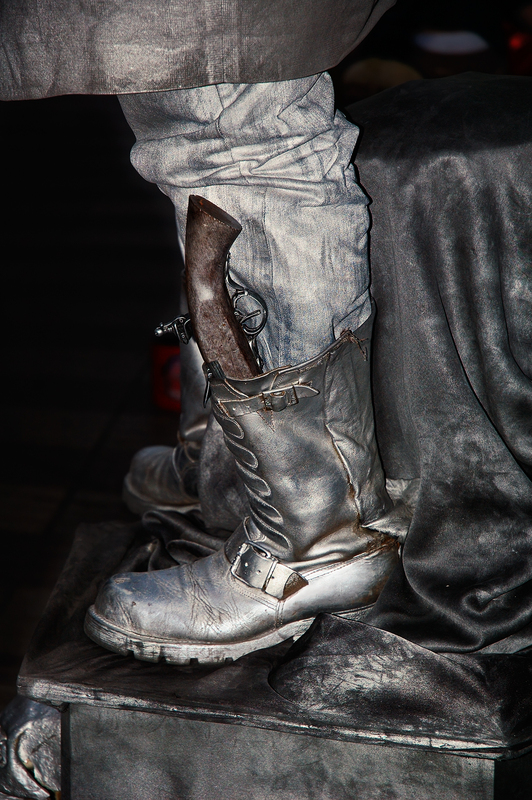 An old pistol and a good coat of silver polish can give the character the final touch. Sometimes you can't tell whether they are impersonating a pirate, a hunter, a cowboy, a soldier or any other sort of scoundrel but believe me, it is fun to watch them perform. No need to say that bootlickers should avoid this area, there is a high risk of indigestion. Tip: Looking for a striking free big format image to use as wallpaper in your destop, yes? then you'd better browse the National Geographic Gallery of Wallpapers. Very nice shot, Carlos. Funny how we usually look at the faces but not the shoes. It's great that you noticed this detail and got such a good photo of it.